Boracay is considered the most popular go-to beach destination in the Philippines because of its powdery white sand, crystal clear waters, fascinating sunset, pulsating nightlife, and a lot more. Why not make the most out of your getaway and stay at Boracay's finest and most luxurious 5-star hotels? #1 - Shangri-La's Boracay Resort and Spa: It's no surprise that this chain of luxury hotels made it on the list as Shangri-La's Boracay setup exudes only of prime luxury and privacy that is perfect for pure relaxation. What sets it apart from other luxury hotels is its homey-tropical feel and its efforts in making the hotel environment-friendly while having all the amenities of a 5-star hotel. #2 - Discovery Shores Boracay: Discover the finest in island hospitality in this iconic and award-winning first-class hotel perfectly located in Station 1 of White Beach. This hotel is most preferred by leisure travelers because of its clean beachfront, modern spacious rooms, exceptional dishes, rejuvenating spa, and impeccable service. #3 - Monaco Suites De Boracay: Far from the hustle and bustle of the island, this Mediterranean-inspired luxury hotel provides utmost relaxation with elegant suites, fresh cuisine, spa, workout room, as well as self-serve laundry service and babysitting perks. It is also the first and only hotel in the Philippines to have solar panels to run the hotel's electricity. 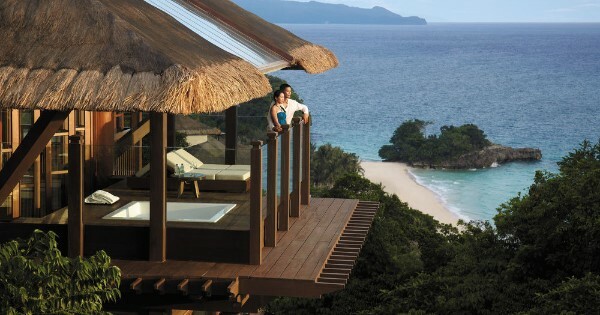 #4 - Henann Regency Resort and Spa: Take away all of your wearies in this 5-star hotel set along the calm beach of Station 2 that offers full relaxation treatment from its in-building spa as well as massage services in your own room. Each of its 302 world-class rooms also come with daily breakfast, lunch, and dinner buffets. #5 - The Lind Boracay: Indulge in the best resort experience in this high-end coastal resort located at the exclusive part of White Beach in Station 1. Equipped with 119 rooms, lush gardens, enormous infinity pool as well as private pools, an exceptional spa, 3 restaurants and a bar, and a signature ballroom for events, The Lind surely is a classic. #6 - Ambassador In Paradise Resort: Right on top of the White Beach in Station 1 is this 5-star hotel and resort that took great advantage of Boracay's powdery white sand with their restaurant, bar, and sun loungers directly situated on the beachfront. What's more, visitors will truly experience paradise with their spacious suites and bathrooms. #7 - Boracay Mandarin Island Hotel: Set in the middle of everything but never crowded, this 5-star hotel in Station 2 makes it easy to stroll around the area without actually getting lost. Feast with some of the best dishes in the area, enjoy its own entertainment with its bar at night and feel the breeze of the sea while staying in one of the 50 rooms that overlook the centerpiece pool. #8 - Astoria Boracay: Have a worthwhile vacation in this contemporary yet sophisticated hotel located at the very heart of White Beach in Station 1. The trendy and comfy rooms, sumptuous food, warm hospitality, and deluxe amenities are what makes Astoria among the best choices for a getaway in Boracay.